The pieces of art in New Members Show 2018 are striking to behold in full-scale. Ultimately, what holds each piece together is the intricate details that go into making such stunning pieces of art. Today, we will look at some of these smaller yet fascinating details you might have missed. This painting is heavily concentrated with alluring images, so it is easy to miss some notable elements. 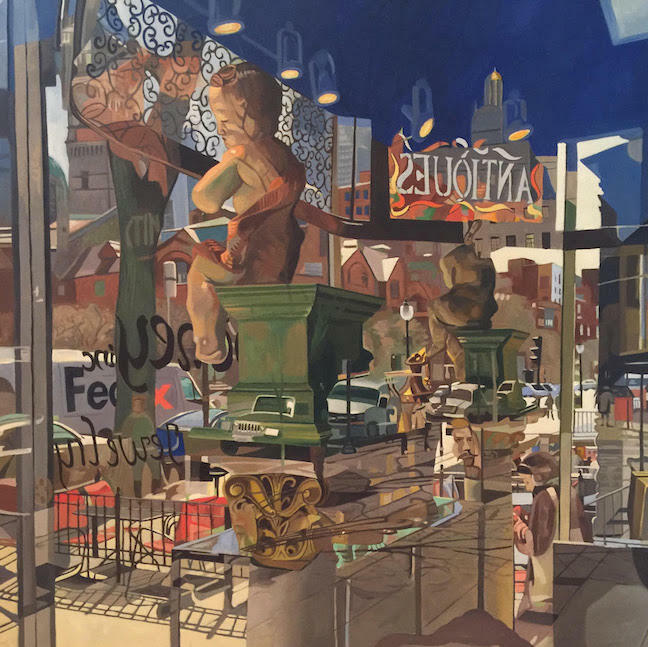 From the reflections of light and shapes on the window pane, to the backwards lettering and street vehicles, Thomas Darsney pays careful attention to every minor detail that brings this composition to life. One interesting feature is the spot where two faces (one of an indoor statue and another of an outdoor woman), seem to face each other by means of reflection. Hannah Cole Dahar’s whimsical painting of blossoming love is more than meets the eye. A number of firetrucks line the background like wallpaper, with only one truck in the corner facing the front. And instead of water pouring from the fire hose, a detailed heart spills out to symbolize that the flames of love will not be extinguished. It is easy to lose one’s self in Robin Colodzin’s abstract mixed media art. Postal Dream Machine is another example of how Coldzin uses found objects to create a sense of dreamy, ethereal spaces. Here, Colodzin uses stamps and other postal ephemera to tie her artwork together. In Anya Leveille’s abstract piece Last Bloom, the most obvious colors at first glance are red and white. However, upon further examination, specks of green, blue, yellow, and orange become more and more apparent. The image above shows a detail of the artwork, with texturized scratches revealing bold intersections of yellow, blue, black, and red. Rosalie Sidoti paints romantic landscapes that exude warmth and beauty. Small touches of boldly colored paint, including fine lines in an orange/red hue, create warm highlights in Evening Salt Marsh’s portrayal of a landscape at twilight. Stelios Mormoris creates the illusion of sparkling confetti in New Year’s Eve. Taking a closer look at the painting, Mormoris uses a wide brush and creates short strokes in extremely bright and dark colors to create this effect. See the finer details in the works of art that are now on view in New Members Show 2018, which closes on February 22.